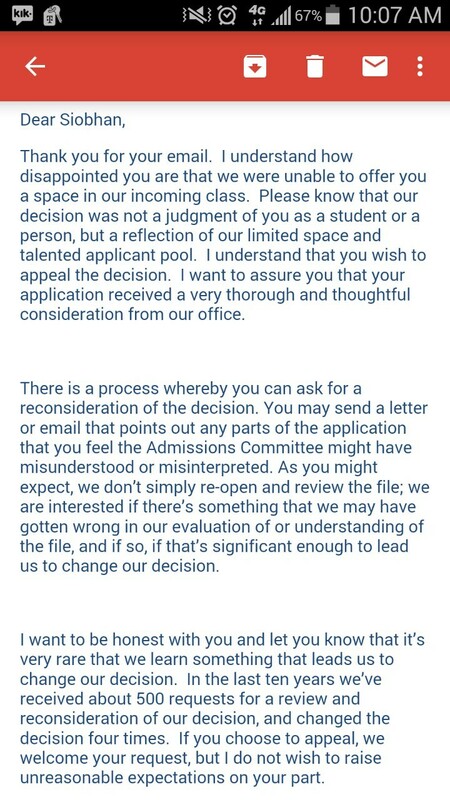 Rumor: Applicant turned down for a college position sends the school a letter declining the rejection. Claim: Applicant turned down for a college position sends the school a letter declining the rejection. Each of my rejections was reviewed carefully and on an individual basis. Many factors were taken into account – the size of the institution, student-faculty ratio, location, reputation, costs and social atmosphere. I am certain that most colleges I applied to are more than qualified to reject me. I am also sure that some mistakes were made in turning away some of these rejections. I can only hope they were few in number. I am aware of the keen disappointment my decision may bring. Throughout my deliberations, I have kept in mind the time and effort it may have taken for you to reach your decision to reject me. Keep in mind that at times it was necessary for me to reject even those letters of rejection that would normally have met my traditionally high standards. I appreciate your having enough interest in me to reject my application. Let me take the opportunity to wish you well in what I am sure will be a successful academic year. engaging in an argument over something the child wants but the parent is declining to provide — the dialogue between the characters subverts that familiarity by stating just the opposite: The parent is in fact trying to provide something desired by the child, but the latter is declining to accept it. We’re so used to the speech cadences and body language of the original scenarios, however, that it’s easy to miss what the characters are actually saying in these commercials by assuming that it fits the expected pattern. The same sort of technique is employed in the example of correspondence reproduced above. Superficially, it looks like a standard rejection letter; upon closer examination, however, one discerns that it is a response from a spurned applicant who is using the same language and format as the original notice to “decline” his rejection (i.e., “I am unable to accept your rejection at this time.”). When I was a senior in high school, I noticed that the rejection letter I received from Harvard had a grammatical error. So, I wrote a letter back, rejecting their rejection letter. Then I sent a version to all the colleges that had rejected me. My mother, Nancy Devlin, sent a copy of this letter to the New York Times and it was published in the New Jersey section in 1981. Then in the mid-’90s or so, there was a cover story in the New York Times Magazine about the trauma students were experiencing getting rejected from colleges. As an education writer, my mom knows all too well that educational issues are cyclical. So she re-submitted the letter. This time it was published in the Op-Ed section of the Sunday New York Times, a very prestigious, high-profile space. It turns out the letter had already become popular and was reprinted in newspapers, books etc. (without my knowledge, pre-internet). The letter remains popular on the internet even today. Despite Whitson’s outstanding qualifications and previous experience in rejecting applicants, I find that your rejection does not meet my needs at this time. Therefore, I will assume the position of assistant professor in your department this August. I look forward to seeing you then. 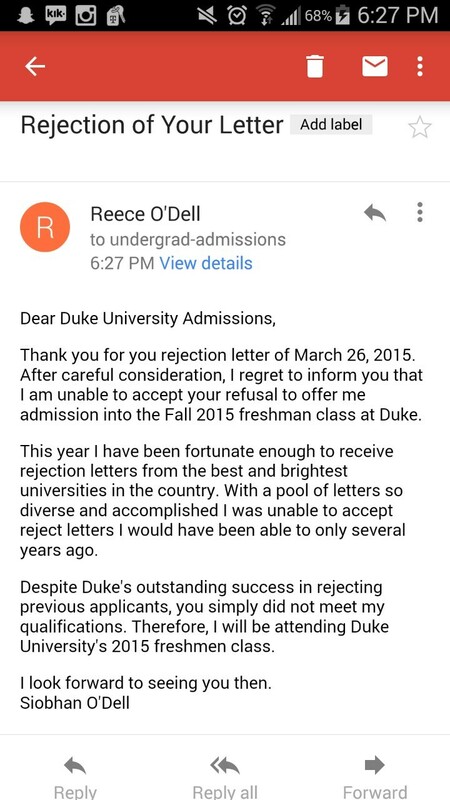 Has anyone ever experienced a positive outcome as a result of sending such a letter after receiving a rejection? We don’t know, but perhaps someone, somewhere has scored a David vs. Goliath type of upset by using a similar letter to impress a prospective educator or employer with his chutzpah and thereby gain a (successful) re-consideration. Sightings: This “anti-rejection letter” is mentioned in Neil Postman’s essay, “Defending Against the Indefensible,” which was included in his 1988 book, Conscientious Objections: Stirring Up Trouble About Language, Technology and Education.